Directors at Stuarts Property Services are regular volunteers for Cancer Research UK and participate in the Relay for Life Stockport each and every year. Our team which includes friends, family, staff members and even sometimes clients hold and attend many fundraising events throughout the year along with a number of other ‘teams’ in the Stockport area. Stockport Relay For Life grand total for our 2016 year stands at an amazing £84,617 raised !!! Many of our clients ask me how we got on after our annual Relay for Life Stockport event, and I give you a general update of where we are up to with our fundraising, but we now have the final count……. 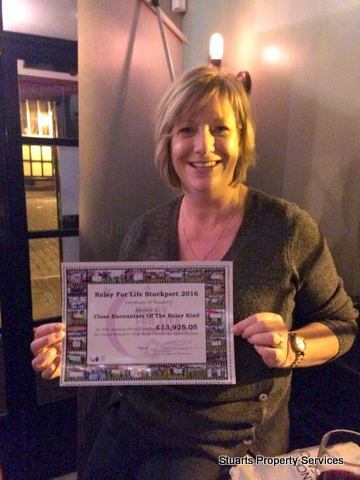 Many of you contribute to our online fundraising page, join in on our letting fee raffle, or attend our fundraising events or just support us generally in the work we do for Cancer Research UK and I am delighted to attach our certificate that we received last night showing the funds that our team (of which I am team captain) raised for Relay 2016. Just to say a huge THANK YOU to each and every one of you that does support us – it really is appreciated and it really IS making a difference at Cancer Research. We don’t do the fundraising for praise, we do it to make a difference and I truly believe that we are; 3 of my team members this year are survivors which is a high percentage of survivorship – we will get there, one day – we will beat Cancer! New apprentice through Damar Training Why an Apprenticeship?